Mouse anti Bovine interferon gamma antibody, clone 5D10, recognises IFNγ, a 19.3 kDa protein belonging to the type II interferon family . Bovine IFNγ is produced by activated lymphocytes, has anti-viral and immunoregulatory properties and is an activator of macrophages.  Clone 5D10 is one of a range of bovine IFNγ reagents available from Bio-Rad which include the monoclonal antibody clones CC330 (MCA2112), CC302 (MCA1783) and 7B6 (MCA1964) along with recombinant bovine IFNγ and bovine IFNγ ELISA kits. Mouse anti Bovine interferon gamma antibody, clone 5D10 is suitable for ELISA and ELISpot, for intracellular identification of bovine IFNγ and may be used in conjuction with clone CC302 (clone CC302 is available in a range of direct conjugates) as a detection reagent. Purified recombinant bovine IFN gamma expressed in E.coli. Spleen cells from immunised Balb/c mice were fused with cells of the Sp20/Ag-14 myeloma cell line. This product may be used in an indirect ELISA or as a capture antibody in a sandwich ELISA together with MCA1783B as the detection reagent. PBP007A may be used as a standard. Walravens, K. et al. (2002) Analysis of the antigen-specific IFN-gamma producing T-cell subsets in cattle experimentally infected with Mycobacterium bovis. Vet Immunol Immunopathol. 84 (1-2): 29-41. Lemaire, M. et al. (2000) Effects of bovine herpesvirus type 1 infection in calves with maternal antibodies on immune response and virus latency. J Clin Microbiol. 38 (5): 1885-94. Kennedy, H.E. et al. (2002) Modulation of immune responses to Mycobacterium bovis in cattle depleted of WC1(+) gamma delta T cells. Infect Immun. 70 (3): 1488-500.